I must admit I read your article in the Metro last week with great interest, for I am a geologist and as such I feel I am adequately qualified to assist you in your volcano-jumping quest. I am very much in accord with your desire to become a perfect fossil, a symbol to the future for our times. But there is one very important thing you must understand first: in order to become a perfect fossil, you must choose the method with the greatest – dun dun duuuun! – PRESERVATION POTENTIAL! For example, you could choose to walk into the lava lake of the fabulous Nyiragongo. But the surface temperature of the lava here is more than 1000°C. Your body matter would quite simply burn away and leave no trace in the fossil record. Darnit! It would have looked lovely and dramatic too! Okay, so no jumping into actual lava. What now? Well, you could try jumping into the centre of a dormant volcano, like the island of Vulcano in Italy. There’s no lava, but there are enough poisonous gases to put an end to things within minutes. These gases are so heavy they cannot rise through the lighter air, so stay sunken in the crater waiting for an unsuspecting potential-fossil. But this option has its downsides too. The dormant volcano may become active again in future, and a massive explosion may blast you out of the crater along with the volcanic plug that’s blocked it up for all that time. Your preservation potential would be – literally – shattered. So maybe this option’s no good..
We could try one of Vulcano’s cousins, Stromboli. If you are lucky enough to get close to Stromboli while it’s erupting, you might stand a chance of being hit in the head by a boiling lava bomb (like my old teacher did – don’t worry, he survived – it was not his time to become a fossil!). Provided enough lava bombs by chance hit you, you could become buried in rapidly cooling rubble, which has a little more preservation potential than the previous options. But we’re going for perfection here. Let’s skip across to Vesuvius. Everyone knows AD79, the eruption that decimated Herculaneum and Pompeii, right? Okay, most people in that debacle died in the massive pyroclastic flow (a mess of fluidised ash, air and hot stuff from the earth’s belly) that engulfed the region. Pyroclastic flows can move as fast as a car on the motorway, and it would be a pretty quick way to go! Maybe this would be a good option, then? You would be fossilised in ash, provided that nobody disturbed your remains. For what would happen if you were disturbed? Volcanic ash is not the strongest of materials, even when it forms a concrete-ish mass called an ignimbrite. It’s still quite easy to disturb, and in a volcanic area, earthquakes and future eruptions seriously lower your chances of perfect preservation. There’s also the fact that the intense heat from the pyroclastic blast will strip away the finer features of yourself, the minutiae that would render you a perfect fossil. So what is the ultimate solution? There has to be one, right? Your best bet really is just to wait until a massive volcanic eruption or meteor strike occurs, and while the ensuing particles to taint the atmosphere and the oceans with poison, wait in a shallow muddy sea until the water becomes completely devoid of oxygen (ensuring all the fishy things in the sea won’t nibble at your body), then wait until the toxic atmosphere really takes hold. Et voilà! A couple of million years from now and your body will be perfectly, wonderfully preserved! (Provided plate tectonics doesn’t get in the way in the meantime!) You would have successfully become a Lagerstätte, which is the word we geologists use for the most amazingly preserved fossils in the world! It’s new, it’s exciting, and while it kind of sounds like a dance move, the Tangaroan style is in fact the newly classified third type of eruption style. We’ve got eruptive and effusive and now this. It was classified by a team of researchers from the National Oceanography Centre (Southampton, UK) and Victoria University (Wellington, New Zealand) who studied Macauley volcano in the south west Pacific. The news appeared in this month’s edition of Nature Geoscience. The paper is called ‘Highly vesicular pumice generated by buoyant detachment of magma in subaqueous volcanism‘. Well, the Tangaroan style is specifically an underwater eruptive style. If it had happened subaerially it would be intermediate – somewhere between effusive and eruptive. And the main defining feature of this style is its foaminess. See, lots of vesicles form in the magma, and as it bubbles up it turns into a kind of foam, which detaches as packets of pumice and rises. Because of the effects of decreasing water pressure, the bubbles continue expanding so you end up with various sized bubbles by the end of it. Pumice (which is usually a sign of explosive activity in subaerial volcanoes) is quite common in underwater volcanoes, and this new research means that underwater volcanoes currently marked as having explosive eruptions in the past may be reassessed under this new category. Exciting stuff! The style is called Tangaroan after the Maori god of the sea, but it also acts as a homage to the ship used to collect samples, which shares the name. Fun fact: Tangaroa is also part of the Cook Islands’ mythos and has yellow hair, so when Europeans first visited, they were considered the children of Tangaroa. In August of this year, a vast pumice raft was spotted off the coast of New Zealand. This is a rather interesting phenomenon – rocks floating in the ocean! – and it arises from the fact that pumice is lighter than water. See, pumice has tons of vesicles in it – namely, air holes, gaps in the rock. It is made from very viscous, ‘bubbly’ magma. In other words, it is the froth on the latte of a volcanic eruption. First noticed by a New Zealand marine aircraft, and reported by science writer Rebecca Priestly, who happened to be sailing close by, this particular pumice rafting event was not caused by what we would think of as a ‘normal’ volcano. No – it was underwater. It was apparently caused by Havre seamount in the Kermadec Islands, the volcanic byproducts of an underwater subduction zone just north of New Zealand. The weirdest thing for me when studying geology was finding out that pumice rafts can appear as a result of underwater volcanic activity. Undersea volcanoes are usually typified by mafic magmas, whereas pumice is more commonly associated with felsic or andesitic activity – stratovolcanoes such as Mount St Helens, or Vesuvius. It’s got the same chemical formula as obsidian, which is often associated with a type of felsic magma called rhyolite. And, to further these associations, when Vesuvius erupted in 72AD the resultant Plinian style eruption column rained out a crap-ton of pumice over the sea in the Bay of Naples. This made sense to me when I first heard it – Vesuvius is andesitic. So in my mind, pumice equals felsic, andesitic, big Vesuvius-type stuff. What was new to me was realising that pumice can quite often be mafic, and that underwater volcanic eruptions involving mafic material and pumice are actually quite common. Just take a look at this image from a study published in PLOS earlier this year. The study is actually open access, so you will be able to download and read at your leisure. So what kind of conditions would lead to an undersea volcano producing pumice rafts? Well, they are very common around subduction zones, where you will find more violent forms of eruptive activity that are more likely to cause the viscous bubbliness necessary for pumice to form. Not that it doesn’t happen in spreading ridge settings, it’s just less common. The major pumice rafts in the news recently have been from the Tonga – Kermadec region. This particular raft grew to over 20,000 square kilometres. A venerable floating island indeed. It is made all the more interesting by the fact that pumice in recent years has been shown to be a decent substrate for distribution of marine life around the oceans. 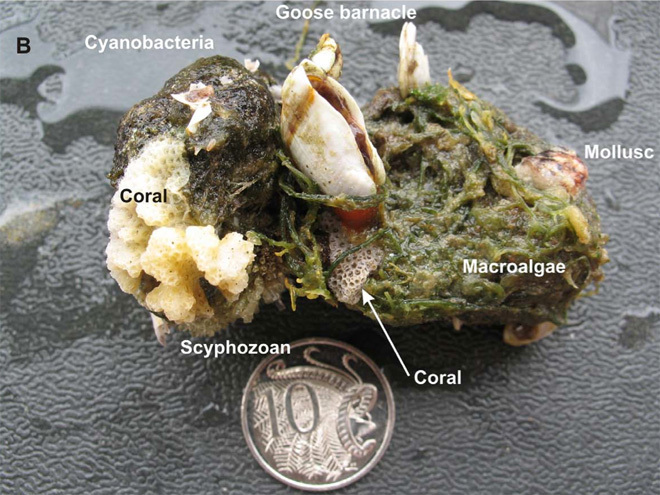 Take a look at this snapshot of a piece of pumice colonized by various life forms. How cool is that? So I went round my parents house at the weekend, for a quick catch-up since my France trip, and ended up revising my continental geology textbook in the garden whilst my little sister drew on a whiteboard. She drew a volcano, a pretty generic strato-type cone, and proudly announced to me that she knows how to draw them now because she watched Aloha Scooby Doo the other day. Uh-oh. Once my brain’s in geo-mode I can’t seem to stop. Aloha = Hawaiian, and I know there are no stratovolcanoes on Hawaii. I them draw some lava bombs coming from the top of her stratovolcano, and tell her this is a Strombolian type eruption, and that I went to Stromboli last year. I told her I’d watched the eruptions from the side of the volcano itself, but that it was safe because the eruptive material always tended to go down the same ash slope, so we could avoid it. She proceeded to draw a little stick figure me halfway up the volcano. Then I showed her another type of volcanic eruption, Plinian eruptions. I drew a picture of a lava dome resembling Mt St Helens for ease of understanding, and explained that in these kind of eruptions, there are huge clouds of ash that kill more people than the lava does. I told her about Pompeii – she’s pretty young still, and hasn’t yet done the Romans at school – and when it got to the fossilised ash people thing, she was pretty horrified. To annotate my diagram she drew a person lying on the ground to signify one of the ash mummies and added a ‘x1000’ after it. She was still pretty hungry for more info, so I told her about hydrothermal vents, to which she replied, ‘Oh I saw something about those on TV.’ I told her that the crabs and worms that live there feed off the chemicals from the vents, and can live on the sides of the vents even though it’s very hot. She then told me a fact – that islands are actually mountains rising up from the sea floor. She even drew me a picture of it. I said ‘Did you know you can get mountains under the sea too?’ and she was astounded. We added an undersea mountain chain to our diagram. I didn’t do much revision after that, teaching was too much fun. Later we watched Futurama, in which they happened to go up Olympus Mons. I realised they’d made the mistake of drawing it as a stratovolcano, exactly the same as Scooby Doo had done, but I think by now I’d given my sister enough food for thought. Maybe I’ll tackle Olympus Mons next time!